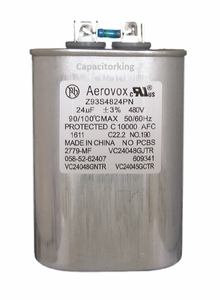 Aerovox Z93S4824MN/2779-MF 24UF 480 Volt, 1000 Watt Metal Halide Capacitor. Commonly used for 1000 Watt Metal Halide fixtures and works with M-47 bulbs and a constant wattage autotransformer circuit type ballast. The case is 1.75" oval and 3.88" tall with a maximum temperature rating of 100oC. This case has a resistor that dissipates charges to less than 50 Volts in 60 seconds to be DE energized. This unit has a protective interrupter device to open the circuit at failure or the end of life. 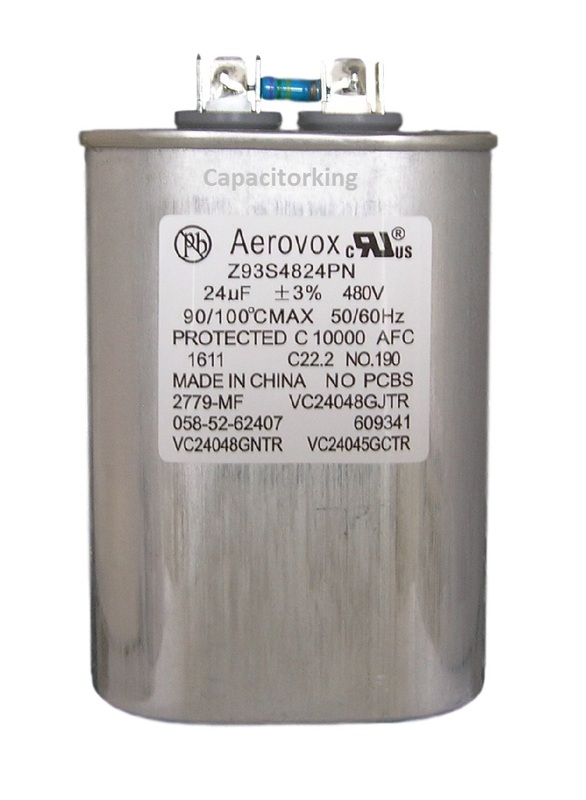 All Aerovox lighting capacitors have resistors, some resistors are internal and others are external. Capacitors do deteriorate; stop replacing ballast kits if the transformer is good, the average life of an Aerovox capacitor is 60,000 hours, most other brands of capacitors only average 10,000 hours. They can become weak, this is easy to check. See the Meters Section or Video Section on homepage.